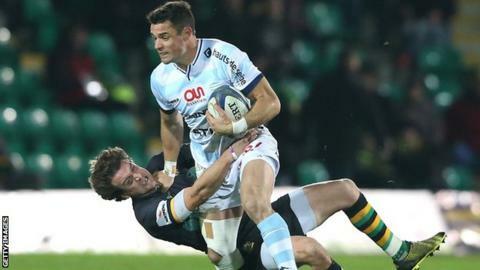 Northampton were held to a draw by Dan Carter's Racing 92 in Pool Three of the European Champions Cup. Saints suffered a heavy 33-3 defeat in the reverse fixture last weekend. Jim Mallinder's side fared much better in front of a home crowd on Friday but failed to cross the try line. Northampton fly-half Stephen Myler and his Racing counterpart, World Cup winner Carter, kicked three penalties apiece as the two sides were forced to share the points. Saints were down and out by half-time in last weekend's contest in France after going in 18 points behind. The Premiership club were much more competitive in a cagey affair at Franklin's Gardens, but were unable to cross the whitewash and have now scored only one try in their last four games. Myler kicked Saints into an early lead with a long-range penalty, but New Zealand great Carter, in his second game for Racing, soon levelled the score from the tee before adding a second against the run of play. The fly-halves exchanged two more penalties each in the second half, and it was Saints who looked like the bigger threat in attack. Their best chance for a try came on 66 minutes, when the usually reliable Carter saw his clearance charged down by George Pisi and Saints tried to scramble over from a five-metre scrum, but they were eventually penalised and the visitors cleared the danger. The result leaves Northampton second in their group, two points behind leaders Racing who have a game in hand. Northampton: Foden; Elliott, G Pisi, Burrell, North; Myler, Dickson (c); A Waller, Haywood, Brookes; Lawes, Matfield; Gibson, Harrison, Dickinson. Replacements: Hill for Brookes (28), Fotuali'i for L Dickson (52), C Day for Matfield (52), E Waller for A Waller (65), Paterson for Lawes (65), Hanrahan for G Pisi (71), K Pisi for Elliott, Williams for Harrison (74). Racing 92: Dulin; Rokocoko, Laulala, Chavancy, Imhoff; Carter, Phillips; Ben Arous, Szarzewski (c), Tameifuna; Charteris, Van Der Merwe; Lauret, Nyanga, Masoe.